Taking place on Sunday 14. February at the Royal Opera House, London, this year’s ceremony will be hosted by Stephen Fry and broadcast on BBC One and BBC One HD on Sunday 14. February, 9pm. Awards presenters and other attendees include Domhnall Gleeson, Cuba Gooding Jr, Douglas Booth, Emilia Clarke, Jack O’Connell, Julianne Moore, Matt Smith, Rebel Wilson, Riz Ahmed, Sacha Baron Cohen, Stanley Tucci and more. And, nominees up for awards include Alicia Vikander, Bel Powley, Bryan Cranston, Cate Blanchett, Christian Bale, Dakota Johnson, Eddie Redmayne, Idris Elba, John Boyega, Julie Walters, Hou Hsiao-Hsien,Kate Winslet, Leonardo DiCaprio, Maggie Smith, Mark Ruffalo, Matt Damon, Michael Fassbender, Rooney Mara and Saoirse Ronan. The Outstanding British Contribution to Cinema Award will be given to Angels Costumes and Sir Sidney Poitier is to be honoured with the BAFTA Fellowship. Another nomination for Cate! Winners of the 13th ICS Awards will be announced on February 21, 2016. Cate Blanchett wins an AACTA International Award! Cate Blanchett won another award for her role in Carol! The Australian Academy of Cinema and Television Arts recognized Cate Blanchett as the Best Lead Actress of the year. Rooney Mara received the AACTA International Award as Best Supporting Actress. Cate Blanchett won a Dorian Award as Best Actress! Fifties romance Carol was the big winner in the Gay and Lesbian Entertainment Critics Association awards – the Dorians – taking five top prizes including best film, best director for Todd Haynes and best actress for Cate Blanchett. The critically acclaimed period drama, which was nominated for six Oscars last week, also won best screenplay (for Phyllis Nagy’s script) and best LGBTQ film, while Haynes also received the Wilde artist of the year award. Carol’s success represents a fillip for Haynes and his team after the Cannes prize-winner unexpectedly missed out on Academy awards nominations for best film and best director . Blanchett and co-star Rooney Mara are up for best actress and best supporting actress respectively, with the latter the current bookmakers’ favourite to take home the prize, and Nagy also has a nod for best adapted screenplay. Yesterday there were also the Sydney Theatre Awards, but Cate didn’t won for The Present. Great news! 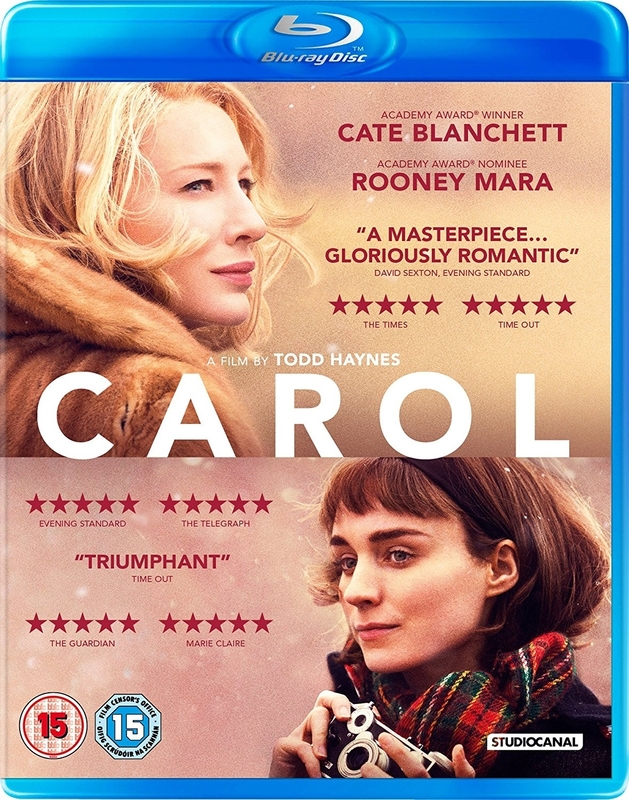 Carol will be released in DVD and Blu-Ray from March 15, 2016 in the US, then in the rest of the world. In the UK, the dvd will be available from March 21, 2016. Talking about Carol, yesterday there were two awards ceremony: the Critics Choice Awards, where Cate wasn’t present and that have seen Brie Larson win in Best Actress in a Drama category, and the London Critics Circle Film Awards, where Charlotte Rampling won the Actress of the Year Award. After the Oscar nomination, it’s time to make another summary of the nominations/awards received by Cate for her role in Carol. If you notice something missing, please, let us know.